As I often mention, I hate all domestic chores and spend considerable effort avoiding them. In fact, the amount of energy I devote to dodging household tasks easily surpasses what it would take to just git ‘er done. This week is going to be tricky, because our dear friends are coming to spend Thanksgiving with us. If it was just us, I’d either: 1) Finagle an invite somewhere else and show up with wine in hand, 2) Make a new tradition where we spare the bird and eat take-out pizza instead. But these friends are very special and I want to do up the holiday with a Martha Stewart (lite) spin. 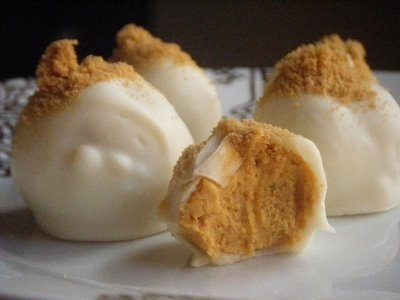 Pinterest usually just makes me feel bad about myself and my inadequacy, but I found these pumpkin cream cheese truffles and am thinking about giving them a go. P.S. Without hyperbole, I can state that our local grocery store is currently the most hateful place in the universe. Last minute shoppers are vicious!